This is a keto recipe so make sure you are following that eating structure entirely before throwing something like this in the mix. Just looking at these things with their lemon zest and raspberry goodness is enough to make you wanna go Keto right? This concoction of tart lemon and sweet raspberry is a real winner, and they are filling enough to ensure you eat just one! One of the best things about this recipe is that the dough is puffy and delicate. It has the consistency of your everyday pastry dough. The trick to making the consistency so similar to regular pastry dough is mozzarella cheese. Though this may sound like an unusual choice I assure you that its the perfect ingredient that makes this dough delicious and gives it that yummy flaky consistency. These rolls are best served fresh out of the oven, though, they can be stored in the fridge and reheated before serving. The glaze will thicken slightly in the fridge so a few minutes in the oven (around 200 degrees Fahrenheit) in an oven-safe container will take care of the thickening. Besides having leftover rolls in the fridge makes for excellent motivation for getting out of bed in the morning! Right, Ian and Belle? My only question before moving on to the recipe is… who’s bringing me some? And for the client who told me, that they can’t give up pasta… I’ll provide a delicious spaghetti squash recipe right here next week! Serves 8. Each serving comes out to be 272.25 Calories, 23.18g Fat, 5.24g Net Carbs, and 10.04g Protein. Use an electric mixer to beat the cream cheese, butter, sweetener, vanilla extract, lemon extract, lemon zest, and lemon juice until smooth. Set aside. In a medium saucepan, whisk together sweetener and xanthan gum. Gradually add water and lemon juice while whisking. Set heat to medium-low. Add frozen raspberries, stirring constantly. Just when the sauce begins to simmer, remove from heat and set aside. Preheat oven to 350 degrees Fahrenheit. Spray a 9” circular pan with coconut oil or grease with butter. Have two 15 inch sheets of parchment and a rolling pin handy. Meanwhile in the top part of the double boiler (with it not over the water) combine the almond flour, stevia/erythritol sweetener, xanthan gum, and baking powder using a whisk. Stir in the egg and vanilla extract. The mixture will be very thick. Stir in the mozzarella cheese and place the bowl over the pot of simmering water. Be sure to protect your hands from the hot bowl and the steam escaping the pot. A silicone mitten works well for this purpose. Stir the mixture constantly while the cheese melts and combines with the flour. It will begin to look like bread dough. When the cheese has melted completely, transfer the dough to a prepared piece of parchment. Knead the dough a few times to completely combine the flour mixture and the cheese. Pat dough into a rectangular shape and cover with the second piece of parchment. Roll out dough into about 12″ X 15″ rectangle. Remove top parchment. Evenly spread the lemon cream cheese filling on the dough, leaving about a ½ inch uncovered on the edges. Spread the raspberry sauce over the lemon cream cheese filling. Starting at the long side, roll the dough into a log shape. Press the outside long edge to seal. Using a serrated knife, gently cut the log crosswise into 8 pieces. Arrange rolls in the prepared pan with one roll in the center and the rest circled around it. Bake for 24-26 minutes, or until golden brown. In a small bowl, beat butter and cream cheese with an electric mixer until smooth. Add vanilla, sweetener, lemon juice, and lemon extract and blend until incorporated. Gradually add the almond milk, about a teaspoon at a time, beating the mixture between each addition. My name is Len Benoit and I’m the owner/trainer at Fit 1 in Toronto/Etobicoke. 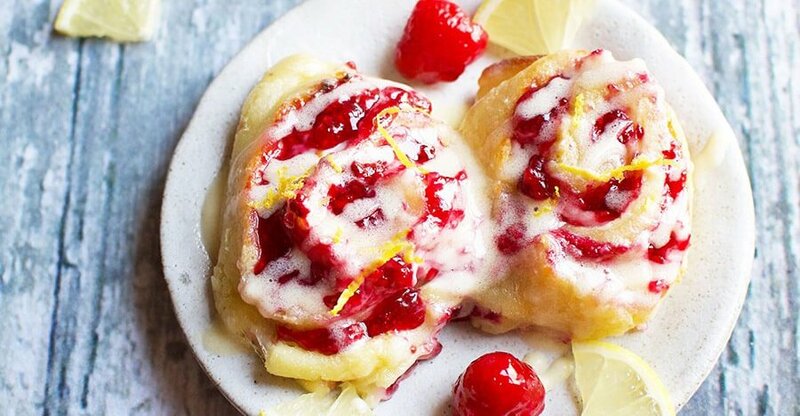 I didn’t invent this delicious #WhatscookinWednesday Lemon Raspberry Sweet Rolls recipe, I spied it on ruled.me.com, but I will enjoy it right along with the rest of you. If you liked this one then there are a lot of delicious recipes just right for you keto journey. Check them out. If you are looking for gyms in Etobicoke or Toronto and want more information about my Women’s and Co-Ed Bootcamp, Youth Sportfit Program, or Personal Training classes, give me a call at 647-776-7776 or visit the website at www.fit1bootcamp.com. Come in for a FREE 7-Day Trial membership if you are friends with one of our members, if not, head on over to the website to learn more about our FREE 1 session mini-session and find out why FIT is right for you!